Out of all the heroines I’ve written, I find Jackie the most interesting character to date. She’s intelligent, capable and willing to put herself out there even if it makes her uncomfortable. But what made her so fascinating to me was that on top of all the emotional baggage, she was like two different people at the same time, Jacqueline Pennington the fallen heiress and Jackie the elementary teacher in need of a break. The tale that the gossips love to repeat amongst themselves is about the poor little rich girl. Jacqueline was born a Pennington which afforded her a lifestyle that was out of the realm of possibility for most people but she was willing to give it all up for Logan Forrester, a young scoundrel who wasn’t of the right breeding for a Pennington. He proved them right the night she ran out of her life and he was nowhere to be found and she was set adrift while the incident got tongues wagging for years to come. To the point where whenever she reappears in society she becomes a curiosity worthy of stares and whispers. The abandonment enables Jackie to become the woman she is presently. Unable to go back to her family and with no one to help her out, Jackie managed to put herself back together, though she never forgets the man that left her in the lurch. Jackie eventually becomes a teacher who spends most of her time working and avoiding the world she used to belong to as much as possible. That is until she is asked to be a part of her old friend’s wedding thus opening up herself to the scrutiny of the gossips once more. And back into the arms of Logan, who she still blames for abandoning her and ruining her life. But had he really? Sure he turned her life on his ear when he left but she’s out of the clutches of her overbearing parents and she’s made a life for herself that she can be proud to say she did on her own. So was her life truly wrecked by what had happened? Mired by all the emotions seeing Logan again brings, Jackie needs to figure out is that her life is not only better now but that it could be that much better with Logan back in it as well. Jaqueline Pennington once had the world at her feet, but she threw it all away for a man from the wrong side of the tracks—handsome, smart and the love of her life, Logan Forrester—only to find that she’d dropped everything for him to abandon her. Logan wanted one thing out of life—to be with Jackie and give her the life she deserved. When that plan went to hell, he walked away and applied himself to becoming a prosperous security software engineer. A job that, years later, brings him back to Jackie. They haven’t seen or heard from each other since that fateful night, but the chemistry that still crackles between them is too good for either one to pass up. So Jackie and Logan reach an agreement and burn off the sexual tension, getting closure during their time in St. Lucia. Then, inexplicably, he grabbed Jackie’s arm and dragged her along behind him. Horrified, Jackie gave her friend a pleading look before they rounded the corner and stepped out of sight. He faced her then. Stopped dead in the middle of the hall and zeroed in on her as if she was his prey. He stepped forward, forcing her to jerk back to keep the distance between them. Unfortunately, Jackie backed into a wall and trapped herself. She shoved at his shoulders, but it was like trying to move a brick wall. Jackie’s brain misfired the moment her fingers came into contact his hard body. It took far too long for her to remember she didn’t want him there. Touching her. Overwhelming her senses. Heat flared where his gaze settled. What was wrong with her? “You’re a pig.” Naked under his scrutiny, Jackie pushed harder. Even after the makeover, she felt insecure about her appearance. What was worse was the way her body gravitated toward his. She yearned for him. And it was appalling. How could she still want him after everything he’d done to her? But his voice—his words—had her reacting to him so powerfully. An inveterate traveller, Kait has set foot on three continents and has the other four on her bucket list (yes, even Antarctica). Until she can see them all, she writes romances that take readers to far flung locales, often to places she’s been or hopes to one day go. For now, she’s settled in England where she spends most of her time plotting, scribbling ideas on every available scrap of paper and trying out dialogue on her cat. 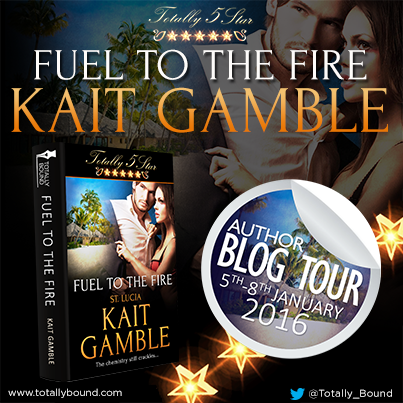 Enter Totally Bound’s January blog tour competition for your chance to win a free eBook of your choice from the store.